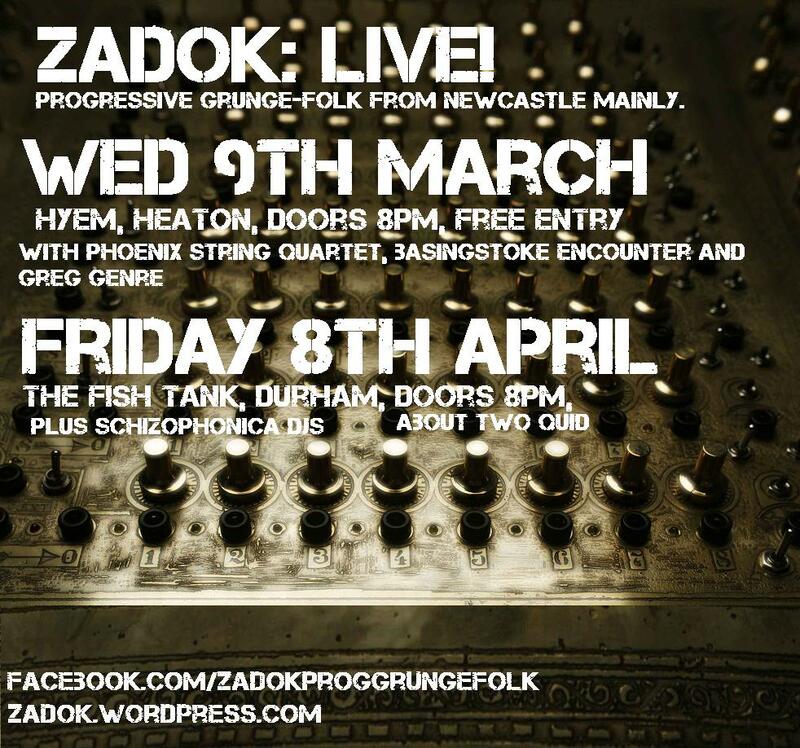 north east band | Zadok: Progressive Grunge-Folk. The fantastical story of Zadok. Secret Gig Thanks. Ear Plugs. If, like many visitors to this blog, you are new to the music of Zadok, the following things might be of interest. Youtube channel (with live footage and japes). Facebook page (now with added social connectivity and attendant paranoia). Believe it or not, you can still find us on Myspace, but don’t bother. 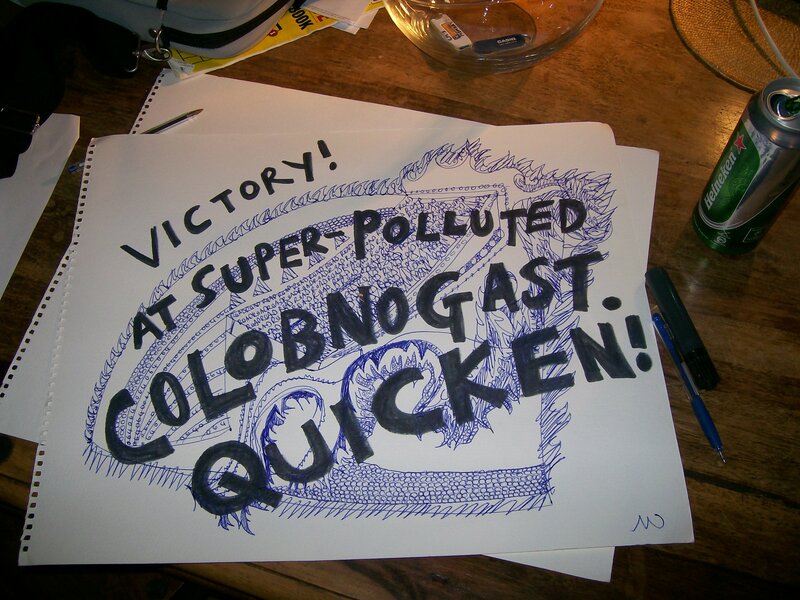 One day we’ll just sack that off, but we’re waiting for news corp to send us some money. However, there is now another mint way to engage with the tendril-equipped Kraken monolith that is Progressive Grunge-folk. It’s a tumblr page that Al has been putting together for people photosensitive to the colour scheme of the Zadok blog, which is where you are. So, stay safe, and get a different perspective on our popular music group here. This fine web page features the entire libretto of our forthcoming massive prog and roll epic, Agitated molecule. If you want, you can see a preview video of the intro for this tune on the aforementioned youtube channel. This preview was recorded in video format a few months ago when Franko and Pete were still at university. Now none of us are at university and the crack is, there’s no better use for four pairs of hands than Progressive Grunge-folk, except maybe dry stone walling for charity, so please support your local musical adventurers so maybe they won’t fall apart under the hydraulic Moloch pressure. Heroically, Al has spent a large wedge of time chronicling the adventures and photographic capture-slides pertaining to our band over the last two or three years. Indeed, since the beginning. You are required by law to read through the whole thing each time something new is added. Rock the Barn is coming: on July 1-3, lots of hairy people take over part of a farm site. Mint. Two stages, competitively priced beverages and lurds of bands, including Zadok on the Saturday night. Check it out here: http://www.rockthebarn.me ! Hey all…. exciting performances of Progressive Grunge-folk are on the cards for the people of the North East. Friday April 8th 2011: Live! At the Fish Tank in Durham. Near the tattoo parlour so you can get a QR code linking to our fan page tattooed on your forehead on the way out. It’s as part of this night here – more details to follow but it should be a good un – just us playin and superbly eclectic DJs spinning, errr, everything in the world. Expect our longest and most supremely story-led set(s) yet.